Since the early 2000s, there’s been a disappointing trend in movies away from full-fledged opening title sequences. Whether because of the desire to jump straight into the action or the impulse to keep the audience focused on a film’s story (rather than its creators), elaborate, artful opening title sequences, once commonplace, have become increasingly rare—which is too bad. Great opening title sequences do a whole lot more than just show the names and guild memberships of those behind-the-scenes folks who make it all happen. They can do the critical early-movie work of establishing a movie’s mood and texture, divulge key world building details and set an energy level to which audiences can quickly attune their own attention and expectations. Used effectively, opening titles are an incredibly useful filmmaking tool and can also (in some cases) stand alone as their own discreet units of artistic expression—a stylish, snackable capsule of entertainment wholly enjoyable on their own apart from the film they’re ostensibly announcing. Where else in cinema is there such an obvious opportunity to experiment with music, graphics and cool typeography? For this week’s Must-List we asked our Film Independent bloggers and staff to share some of their favorite opening titles. So take your thumb off the DVD player’s skip button and take a moment to luxuriate in these one-of-kind credits sequences. I’m going to throw down and say that this is perhaps the most meta and iconic of all title sequences in the history of cinema. It’s a dazzling combination of Saul Bass’s brilliant vision, John Whitney’s technical wizardry and Bernard Herrmann’s eerie music. The dizzying, disorienting effect of the spirals, circles and swirling shapes (spirographs and Lissajous waves), plus the extreme close-ups of eyes and lips, foreshadows the film’s thematic, musical and visual motifs, setting the tone for the essential instability that is Hitchock’s Vertigo. Spirals (which were likewise featured in Vertigo’s poster art) are an important recurring visual motif in the film: the staircase, the winding roads, Kim Novak’s hair… Some critics have even argued that the byzantine narrative of Vertigo is itself like a spiral, with the hero failing again and again, continuing to tumble down. Fun trivia about the title sequence: John Whitney, the computer animator who actually executed Saul Bass’s idea, had to invent a machine to realize these graphics. He used a modified World War II device that helped anti-aircraft cannons pinpoint their targets, creating dazzling, complex images. 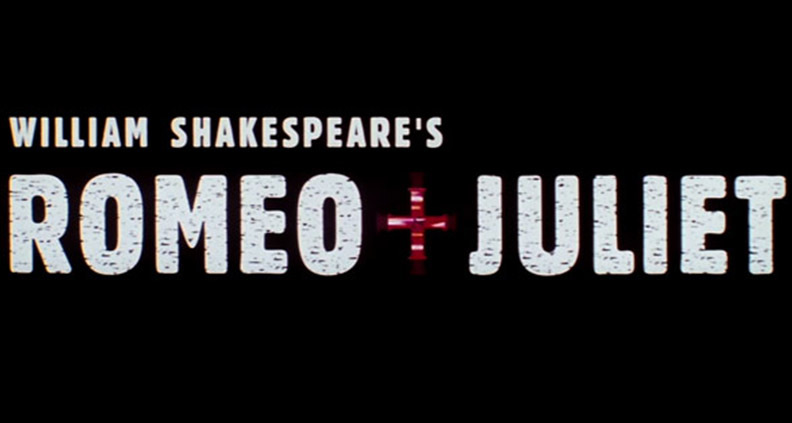 When I think of memorable title openings I can’t help but recall Baz Luhrmann’s William Shakespeare’s Romeo + Juliet, an inspired reimagining of this most famous work by the playwright. Luhrmann is a visionary director known for his unique adaptations of literary classics that deliver stunningly vibrant visuals and incorporate modern soundtracks. For this film the director does an excellent job of creating an opening that delivers more than just the title, tone and a visual sense of what’s to come. Luhrmann begins by communicating the modern setting for the film (which was largely shot in Mexico City). The movie opens with the prologue from the play, which is delivered by a news reporter within a television set, her words punctuated with animated text. The prologue is then re-voiced by the actor Pete Postlethwaite, who also plays Father Laurence. This serves to give the viewer a second chance to make sense of the language. Luhrmann and editor Jill Bilcock strengthen this second reading of the prologue by using visuals created specifically for the opening, which help the audience decode and acclimatize to the unfamiliar Shakespearean prose. We are then introduced to the cast with cinematic freeze-frames and graphics that ID Shakespeare’s characters. It is truly a fantastic blend of visual imagery, graphics and a powerfully dramatic score delivering an opening that sets the stage for this tragic love story. From Nicholas Winding Refn to Lars von Trier, the enfant terribles of European art house cinema have a distinctly continental knack for announcing their films with bold, brash and downright obnoxious title sequences perfectly calibrated to fry their audience’s circuit boards. But no title sequence is quite as assaultive (and artful) as that from French-Argentinian provocateur Gaspar Noé’s seedy 2009 afterlife fantasia, Enter the Void. In just over two minutes, Noé and his designer Thorsten Fleish unleash a dense, unholy mishmash of multi-layered colors and fonts, increasing in speed and complexity along to a coked-up techno beat reminiscent (to my ears, anyway) of the theme to the old Mortal Kombat arcade game. It’s bad-trip psychedelic in same way drinking paint (probably) is. Void’s titles set the tone perfectly for the film itself: indulgent, uncompromising and totally gorgeous, at once inviting the viewer to learn in and take a closer look while simultaneously blasting them back from the screen like the dude from the old Maxell cassette commercial. Amazing stuff. In the summer of 1994 a $30 million action film made its money back tenfold and launched the action film career of one Keanu Reeves. 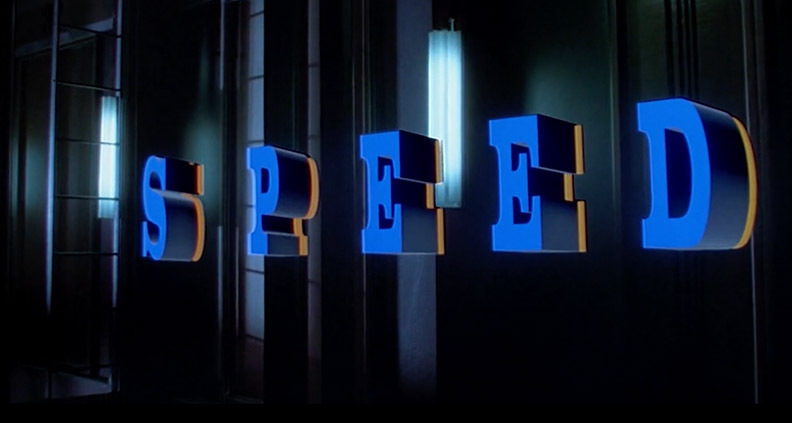 At first glance, the 3-and-a-half-minute opening sequence of Speed may come off as an unassuming stream of title cards, flashing names across the screen while the camera glides steadily down an elevator shaft. But beyond artfully encompassing the film’s theme and tone, there’s so much more going on here: the celestial blue of the font resembles the color of the Big Blue Bus (of the Santa Monica bus line) that can’t go below 50mph on the freeway or the bomb it’s carrying will go off; the endless journey down the elevator shaft parallels the next two hours of relentless thrills and physics-defying action sequences, as LAPD Swat Officer Jack Traven (Reeves) tries to save everyone on the bus; the heart-thumping score by Mark Mancina portends the non-stop violence, death and destruction that will render a happy ending only after a subterranean subway crash. But most importantly, the elevator is where the set-up to the film’s inciting incident transpires: Jack foiled a ransom attempt by a disgruntled retiree gone mad (Dennis Hopper) in said elevator, which propels him to set the bomb on the bus in order to deliver an even bigger pay day for himself. Overall, a brilliant opening sequence that accomplished so much all at once! Inspired to start designing your own typeface or motion graphics algorithm yet? No? Well at the very least you should definitely bookmark the (wonderful) design site artofthetitle.com to learn more about, well, the art of the title. 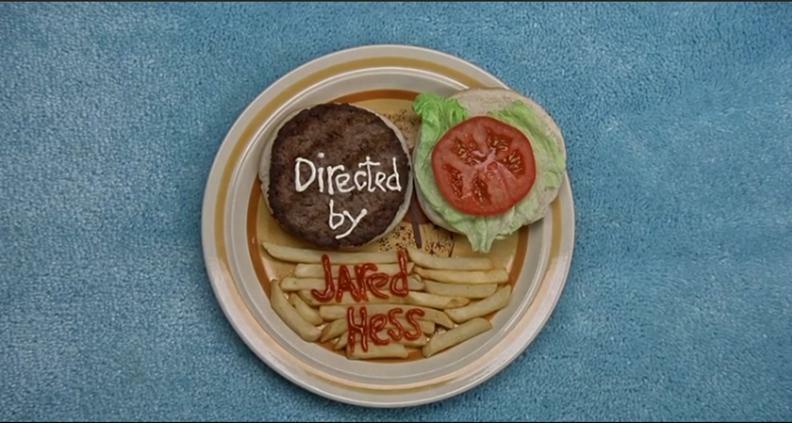 Got a favorite movie opening title sequence? Let us know in the comments, or share your picks with us on Facebook and Twitter. To learn more about Film Independent, subscribe to our YouTube channel. You can catch up with the rest of our blog here. To learn how to become a Member of Film Independent, just click here.